We take a look at the top five facts about the new Maruti Suzuki Ciaz diesel which make it a force to be reckoned with. With the launch of the new Ciaz diesel, Maruti Suzuki has debuted its first-ever in-house developed diesel engine which brings the era of the old Fiat-sourced 1.3-litre Multijet motor to a close, on the Ciaz at least. Besides being a major milestone for the homegrown carmaker, the new motor adds an important dimension to Maruti Suzuki's present and future product strategies. We take a look at the top five noteworthy facts about the new Ciaz diesel which make it an even tougher contender to compete with. As mentioned above, the new Ciaz diesel marks the beginning of a new era for Maruti Suzuki in terms of its powertrain development. The new 1.5-litre DDiS 225 motor in the Ciaz produces 94bhp and 225Nm of torque, which is 5.5bhp and 25Nm more than its predecessor. Further, the new motor also comes paired to a new 6-speed gearbox, ditching the old 5-speed box. Maruti claims that the new motor produces better low-end torque, meaning that the Ciaz will be noticeably peppier while pottering around town. The rise in power and torque though can be attributed to the higher-capacity engine as well as the incorporation of a new high-efficiency turbocharger. Despite upgraded performance credentials, the Ciaz diesel still offers a claimed fuel-efficiency figure of 26.82km/l. The new 1.5-litre motor also puts Maruti Suzuki in the exclusive group of manufacturers who use a cast-aluminium block and cylinder head for its engines. Before Maruti, Honda was the only manufacturer in India to offer it in its vehicles. As is the case with every manufacturer, Maruti Suzuki will extract the maximum potential out of this newly-developed motor by introducing it on more of its models in the coming years. As of now, our sources have told us that the Ertiga is the next model in line to receive this motor. Further, keeping in mind the recent collaboration inked between Suzuki and Toyota, Toyota will make use of the new-age Suzuki engines in its vehicles, which will be produced at Toyota's facility in Poland. This new 1.5-litre motor will also be put to use internationally by Suzuki. Another crucial future purpose served by this motor is that it is already BS-VI compliant. While it will currently go on sale with the standard BS-IV setup, Maruti Suzuki will be ready with the BS-VI upgrades well in time before the new norms kick in. With the onset of the BS-VI norms, Maruti Suzuki might even bring back its Smart Hybrid Vehicle System (SHVS) to the Ciaz diesel (not available currently with the 1.5-litre diesel motor). 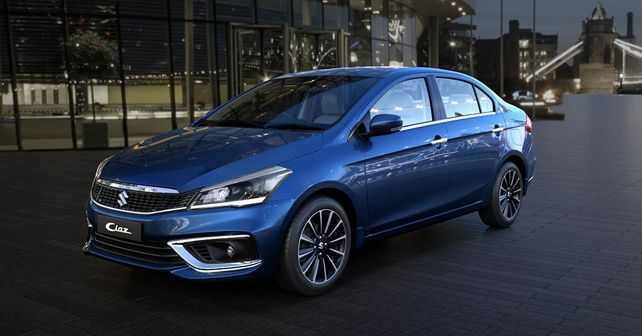 As known already, the Maruti Suzuki Ciaz goes toe-to-toe with likes of the Honda City and the Hyundai Verna. When compared against the two, the Ciaz's ageing 1.3-litre motor proved to be the only chink in its armour in front of the City's 1.5 i-DTEC DOHC engine and the Verna's 1.4-litre U2 CRDI motor. With that resolved, the Ciaz diesel gets a fresh lease of life. However, despite the new motor, the Ciaz still remains the most underpowered car in the lot with its 94bhp output. The only exception here is the 1.4-litre motor in the Verna which pumps out just 89bhp. Otherwise, the 1.6-litre engine produces 126bhp and the City diesel has a power output of 98bhp. The Verna also pips the other two in terms the gearbox choice as it is the only model here to offer both manual and automatic transmission options in its diesel line-up. However, what the new Ciaz diesel loses in power, it gains in fuel efficiency as it remains the most fuel-efficient (26.82km/l) car in the lot. The Honda City diesel has a claimed fuel efficiency figure of 25.6km/l and the Verna offers 24.75km/l (1.4 CRDI). While the erstwhile Ciaz diesel range started from Rs 9.19 lakh, the new Ciaz diesel range starts from Rs 9.97 lakh for the base Delta variant (the new line-up loses the earlier Sigma base variant). Despite the significant price increase, the Ciaz still remains competitively priced, when compared to the Honda City diesel (which starts from Rs 11 lakh). However, the Verna diesel does offer a little better value for money as its base variant is priced at Rs 9.33 lakh (1.4 CRDi E). *All prices mentioned are Ex-showroom, Delhi. The Ciaz enjoys some additional benefits over its two chief rivals: The fact that Maruti Suzuki has one of the biggest sales and service network in the country and the homegrown carmaker's evergreen reputation of being a cost-effective brand, with low maintenance costs of its vehicles and easy availability of spares. Due to this reason, the Ciaz remains the segment leader in terms of sales as Maruti Suzuki sold 24,728 units of the Ciaz in the past six months (Sep 18-Feb 19), compared to the 17,876 units of the Verna and 21,130 units of the City sold during the same time.